The significance of John Thompson III's exit at Georgetown goes well beyond an ordinary college basketball coaching change. 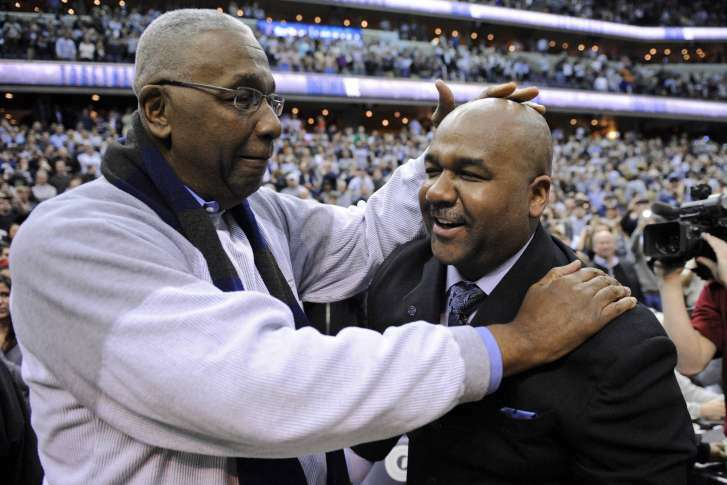 WASHINGTON — John Thompson III’s firing on paper almost makes sense. Consecutive losing seasons for a school that once ruled the Big East. A ninth-place finish this year in a conference that only has 10 schools (and a home loss to lowly DePaul to boot). A 69-62 mark over the last four years, with first weekend losses in the NCAA Tournament (Florida Gulf Coast, Ohio) the rule and not the exception since their Final Four run 10 years ago. You could even make the case that JT3’s Final Four team was built with his predecessor Craig Esherick recruits, like Jeff Green and Roy Hibbert. Forget about those who were shouting “Fire Thompson!” at Verizon Center. Think about the 5,158 who actually showed up to watch the Hoyas host St. John’s. But we don’t exist in a vacuum, and Georgetown’s heart and soul will have to find itself over the next few months as the parting with the son of Big John will need a while to take hold. Think about where the program was when John Thompson Jr. took over in 1972: A private, Catholic university that was near the White House but far from relevant. A paltry postseason history that included one NCAA Tournament berth plus a pair of trips to the NIT. Fresh off a 3-23 season. Enter a 31-year-old high school coach with a couple of NBA Championship rings. Sounds like a bad sitcom on The CW, right? But Big John turned around a program that was fighting for fourth place inside the Beltway behind Maryland, George Washington and American (remember, this was during the Kermit Washington era) into a national power. The 1980s Georgetown teams ran through a newly created Big East Conference and, more often than not, were cutting down the nets at Madison Square Garden each March. Unforgettable stars ranging from slippery guards like Sleepy Floyd and Allen Iverson to giants ranging from Patrick Ewing to Alonzo Mourning. Fantastic supporting players from Victor Page to Jaren Jackson. Under Big John, Georgetown became a Big Deal, locally and nationally. Thompson was more than just successful on the court. The first African-American coach to win a national title was also a vocal supporter of student-athletes, once walking off the court before a 1989 game to protest the NCAA’s Proposition 42 that took scholarships away from academic non-qualifiers. Thompson also went toe-to-toe with a D.C.-area drug dealer to stay away from his players. Big John provided a lifeline for many underprivileged young men … all while winning six Big East Tournament titles and a National Championship. He’s still around the program to this day, sitting on the baseline near the home bench at Verizon Center. And even seated, John Thompson Jr. will always cast a shadow. The transfer from the elder Thompson to longtime assistant (and former player) Esherick in the late 1990s was less than smooth. One trip to the NCAA’s in his five full seasons and no Big East finals appearances. When John Thompson III came over from Princeton (with two NCAA appearances and an NIT berth) to succeed the fired Esherick in 2004, it felt natural to move from one heir apparent to the namesake. And for a while, it was amazing. DePaul never got to the Final Four under Joey Meyer and Sean Sutton was quickly disposed of at Oklahoma State. Pat Knight? A sub-500 record at Texas Tech. JT3 won (albeit with Esherick recruits) and did so by staying true to his Princeton offense roots. People recall the first round flameouts and recent winters of discontent, but I’m going to remember the John Wallace-Jeff Green-Roy Hibbert team that upset Ohio State in the 2006 Sweet Sixteen, advanced to the Final Four in 2007 and ran into a hot-shooting Steph Curry and Davidson the following March. Little did we know, that would be the peak of JT3’s 13-year tenure. I always dreaded “Parent Observation Day” in elementary and middle school. Tough to be “cool-at-school-Dave” when your parents are sitting in the back row. And that was for two hours once a year. John Thompson III has enjoyed the wisdom and guidance of his Hall of Fame father, but has also had his dad in the classroom with him for most of the last 13 years. Big John is not shy when sitting in the back row at press conferences, from calling out referees for sloppy efficiency or kissing former conference rival Syracuse goodbye after a 61-39 thumping at Verizon Center. He’s also protective of his son, having sent someone to pipe down students chanting “Fire Thompson!” at a recent game. One can imagine — despite however beneficial, at times — how uncomfortable it was for JT3 trying to become a successful coach in his own right under a legend he couldn’t hope to match, let alone eclipse. Off the air with WTOP digital sports editor Noah Frank this week, I mentioned how “it’s always easier to perform the autopsy than the diagnosis.“ There will be postmortems on Thompson-the-Younger’s successes and failures, and explanations of why recruiting wasn’t as successful the last few years. There will be discussions about how the Hoyas play in a half-full NBA arena instead of a Cameron 2.0. There will be short lists of who’s next, from Rhode Island’s Danny Hurley (not to be confused with brother Bobby) to current Charlotte associate coach Patrick Ewing (you might have heard of him). There will be a search led by athletic director Lee Reed and former NFL Commissioner Paul Tagliabue. But until we hear what John Thompson Jr. has to say, the final word has yet to be spoken.